J.B. Pritzker is sworn in as Illinois' 43rd governor on January 14, 2019. Lt. Gov. 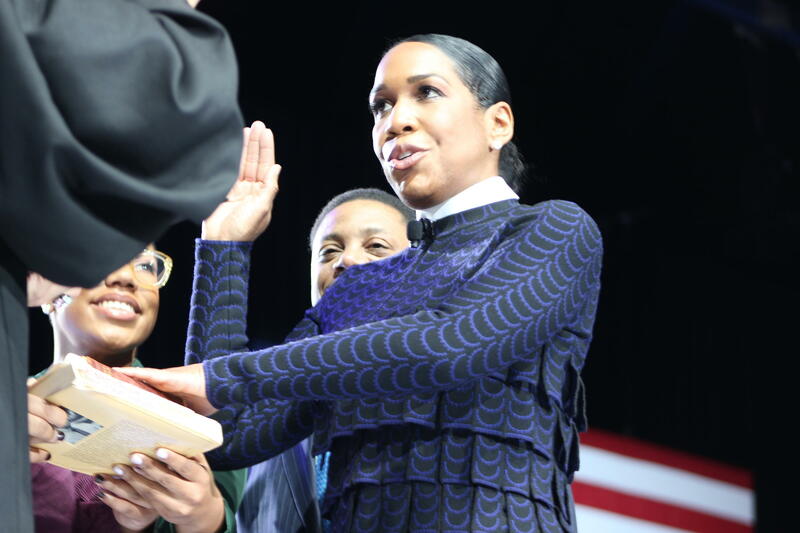 Juliana Stratton is the first African American to serve in that office in the state's history. After being sworn in as attorney general, Kwame Raoul said he would work to protect health care and address gun violence in Illinois. Illinois Secretary of State Jesse White takes his 5th oath of office. Comptroller Susana Mendoza is accompanied by her mother, husband and son to be sworn in. 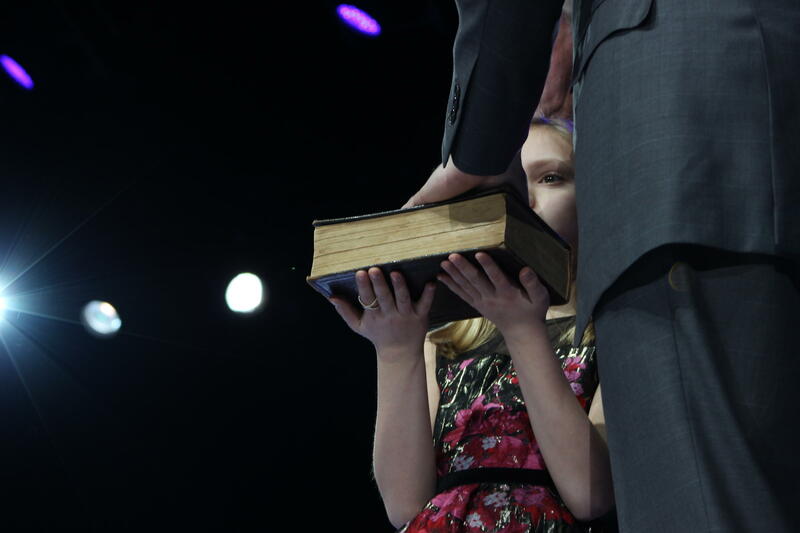 State Treasurer Michael Frerichs' daughter holds a bible while her father takes the oath of office. Filled with concert-like musical performances accompanied by dancing from those in the audience, the atmosphere was jovial at the 2019 Inaugural Address. Democratic state Rep. Sue Scherer of Decatur channeled that excitement. "It's all exciting and everyone is smiling, and hopeful," Scherer said. "I feel very hopeful that we have a bright tomorrow." But as the festivities die down and the 101st legislative session gets under way, Pritzker must work with Republicans -- even in a Democratic majority -- to advance, what he calls, his agenda for the working people of illinois. This includes a $15 minimum wage, commercializing the use of recreational marijuana and enacting a balanced budget. 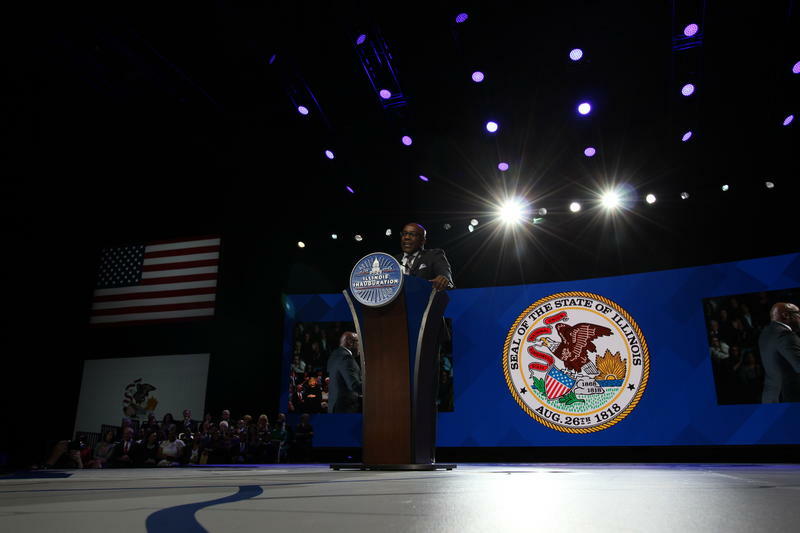 Speaking from an Illinois-shaped stage, made especially for the occasion, Pritzker promised to work on behalf of those hurt the hardest by the two-year budget impasse. "Be clear about this," said Pritzker. "I won't balance the budget on the backs of the starving, the sick, and the suffering. 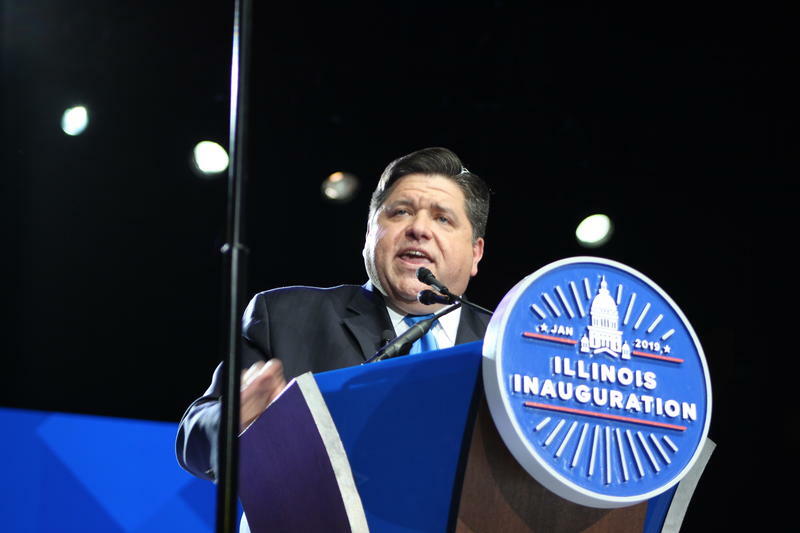 As heard throughout the campaign, Pritzker emphasized the need for a new graduated tax system, where higher income levels are taxed at higher rates. He said the future of Illinois depends on it. "I'm not naive about what it will take to do this," said Pritzker. "All who enter a discussion about our state's budget and a fair tax system in good faith will be welcomed to the table. But if you lead dwith partisanship and scare tactics you will be met with considerable political will." 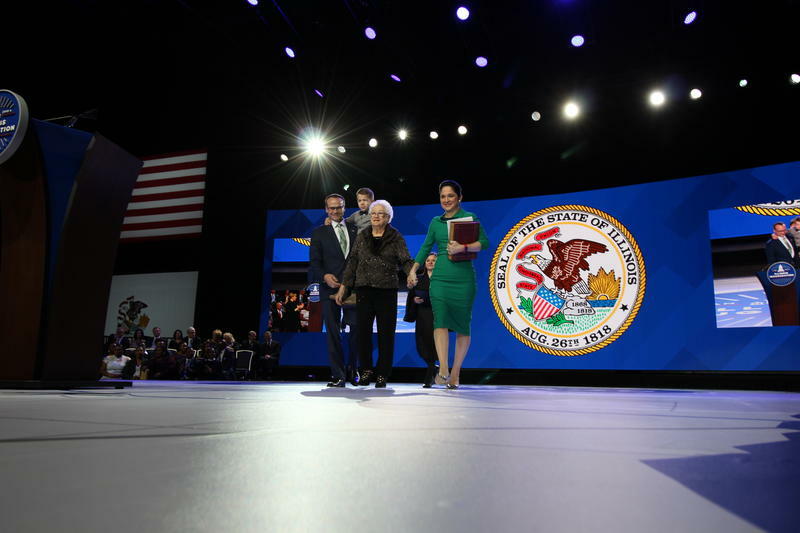 Listen to Governor Pritzker's full inaugural speech. Some Republicans are leery of Pritzker’s graduated income tax proposal, saying it will only hurt the middle class. Republican state Rep. Tim Butler of Springfield says the focus ought to be on stopping economic decline and people leaving Illinois. "We continue to see people move out of the state at a rapid pace," said Butler. "We need to address the situation and that's a combination of the economic climate and the tax structure of Illinois." Pritzker also promised to prioritize workers’ rights. "Working men and women deserve to have a governor and a department of labor that will enforce laws protecting workers' wages and workers' rights," Pritzker said. "And they deserve a $15 minimum wage. It's good for the working famililes of Illinois and good for our economy." Former governor Bruce Rauner vetoed a proposal to raise the minimum wage in 2017 saying the hike would hurt small businesses. Several Republicans have voiced similar concerns. Senate Republican Leader Bill Brady, of Bloomington, said while the Democrats have the majority, passing key legislation that is good for the state will still require working across the aisle. "The Democrats, I don't think on their own, will want to necessarily just deal with ram-rodding their policies through," said Brady. "So, we can be helpful, we are here to be opposed in some ways, but supportive in others." There was an overall feeling of unity from within the convention center where the inauguration took place, but some on the outside are less enthusiastic. Not long after Pritzker was sworn in, Illinois GOP chairman Tim Schneider sent out a statement signaling a clear partisan divide. He said Republicans will hold "all Democrats accountable for their false promises because we know that they are the main culprits behind Illinois' fiscal demise." Despite that bit of shade, Democrats remained jubilant. The crowd seemed particularly excited about new Lt. Gov. Juliana Stratton. She’s the first African American to serve in that office, and talked about the history that led to that moment. "With the DNA of my formerly enslaved great-great-grandfather William Stevens as part of my genetic makeup, I am proud to stand before you as our state’s first black lieutenant governor,” she said. 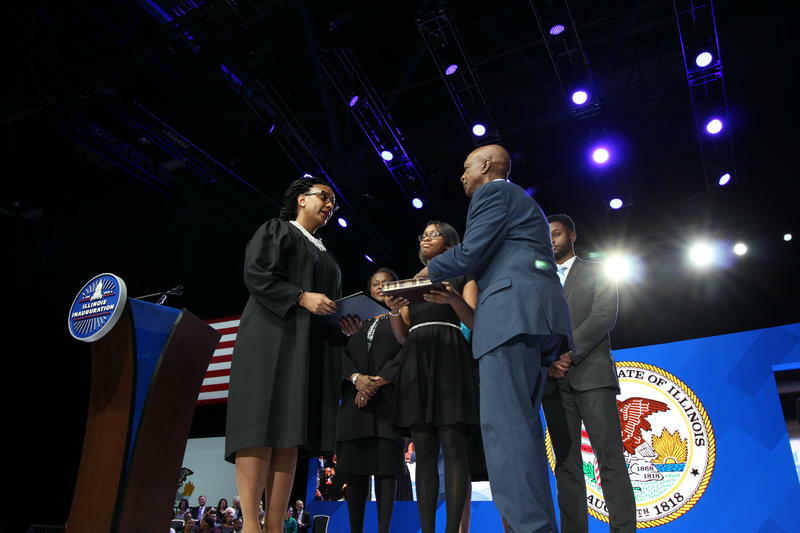 Stratton, along with Attorney General Kwame Raoul, Secretary of State Jesse White, and Comptroller Susana Mendoza mean that Illinois has its first-ever majority-minority cabinet. Pritzker said he’ll be working to include all of Illinois’ diverse voices in his administration. "I want all of the children of Illinois to see someone that looks like them in our government," he said. The Illinois General Assembly began a new legislative session Wednesday—with both new and familiar faces. Though the legislative leaders remain the same, making what was old “new” again, Democrats have expanded their veto-proof majority, known as a “supermajority".